This post will show the process of installing , running and using crtmpserver on ubuntu 64 bit machine with gstreamer . We shall build gstreamer directly from sources . For this we first need to determine if gcc is installed on the machine . GNU Compiler Collection (GCC) is a compiler system produced by the GNU Project supporting various programming languages( C, C++, Objective-C, Fortran, Java, Ada, Go etc). cmake is a software compilation tool.It uses compiler independent configuration files, and generate native makefiles and workspaces that can be used in the differemt compiler environment . Next we create all makefile’s using cmake . If you the following types of errors while pushing a stream to crtmpserver , they just denote they your pipe is not using the correct format. Once the source code is obtained we need to configure , make and make install it . 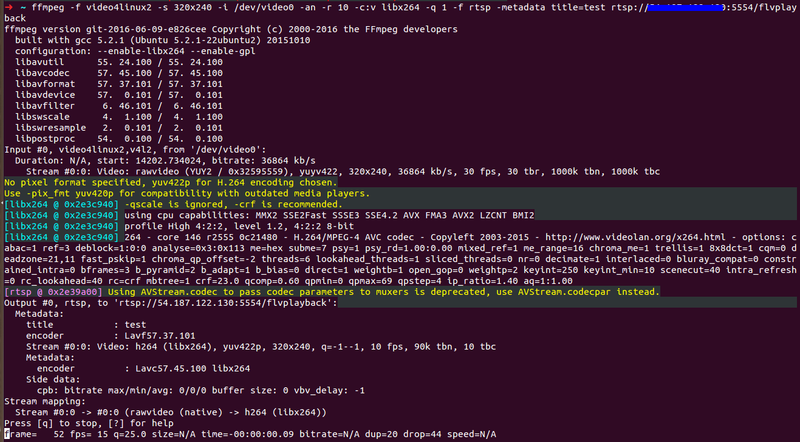 encoding video streams into the H.264/MPEG-4 AVC compression format, and is released under the terms of the GNU GPL. libvpx is an emerging open video compression library which is gaining popularity for distributing high definition video content on the internet. librtmp provides support for the RTMP content streaming protocol developed by Adobe and commonly used to distribute content to flash video players on the web. Additionally “pkg-config –list-all” command list down all the installed libraries. GStreamer is a streaming media framework, based on graphs of filters which operate on media data. Gstreamer is constructed using a pipes and filter architecture. The basic structure of a stream pipeline is that you start with a stream source (camera, screengrab, file etc) and end with a stream sink (screen window, file, network etc). The ! are called pads and they connect the filters. Data that flows through pads is described by caps (short for capabilities). Caps can be though of as mime-type (e.g. audio/x-raw, video/x-raw) along with mime-type (e.g. width, height, depth). To extract the tar.xz files use tar -xf <filename> it will create a folder for each package. GLib package contains low-level libraries useful for providing data structure handling for C, portability wrappers and interfaces for such runtime functionality as an event loop, threads, dynamic loading and an object system. Installing gstreamer 1.8.1 . Gstreamer create a media stream with elements and properties as will be shown on later sections of this tutorial . Source code location : . It will compile the examples .